"You'd never guess these waffles are made without milk and wheat flour. They are so tasty you'll want to add them to your 'use often' recipes." Preheat and grease a waffle iron according to manufacturer's instructions. Beat egg whites in a glass or metal bowl until foamy and stiff peaks form. Lift your beater or whisk straight up: the egg whites will form sharp peaks. Mix spelt flour, baking powder, salt, and cinnamon together in a bowl. Whisk egg yolks, soy milk, apple, and vegetable oil together in a separate bowl; pour into flour mixture. Stir to combine. Fold egg whites into batter, leaving some clumps. 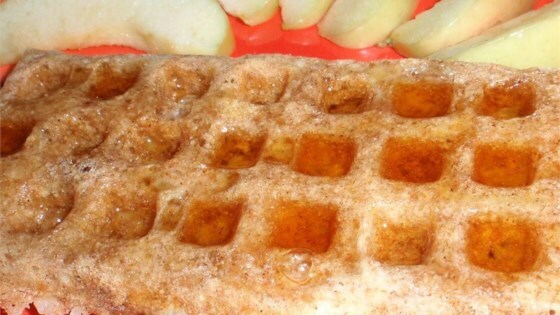 Pour about 1 cup batter into waffle iron; cook until golden brown and crispy, 5 to 10 minutes. Repeat with remaining batter. Great recipe! I substituted applesauce for the apples, just for ease. Don't skip the oil if you use applesauce, they won't bind together properly! Best gluten free waffles I've tried so far! Spelt is a type of wheat and contains gluten. It does have a wonderful flavor.